Home Collectie Barometers A DUTCH CONTRA-BAKBAROMETER Solaro en Butti te Amst. A DUTCH CONTRA-BAKBAROMETER Solaro en Butti te Amst. Signed: Solaro en Butti te Amst. 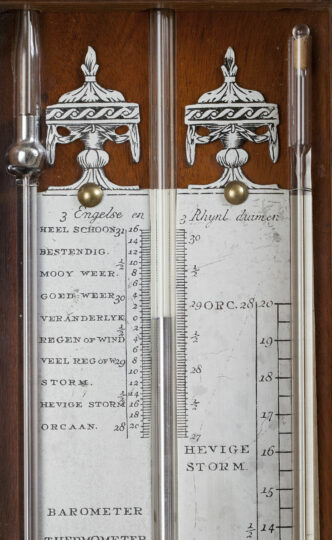 The barometer has two pewter engraved plates. The left plate has a scale in inches. Beneath this scale in a medallion the signature Barome¬ter Thermometer en Controleur door Solaro en Butti te Amst. is engraved. 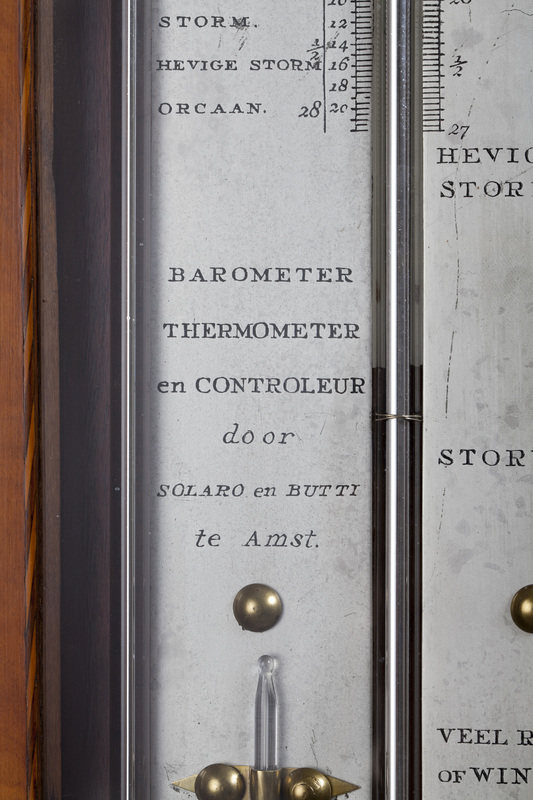 The thermome¬ter is placed beneath the signature and has a Fahrenheit and Réau¬mur scale. The right plate has on the left the scale of the center-tube in ‘Rijnlandse duimen’ and on the left a scale in inches for the “contraroleur”. In the case on the right the contra-tube is placed. This tube gives a more exact indica¬ti¬on. The barometer has a brass hand. The two scale-plates are surmounted by two engraved vases. 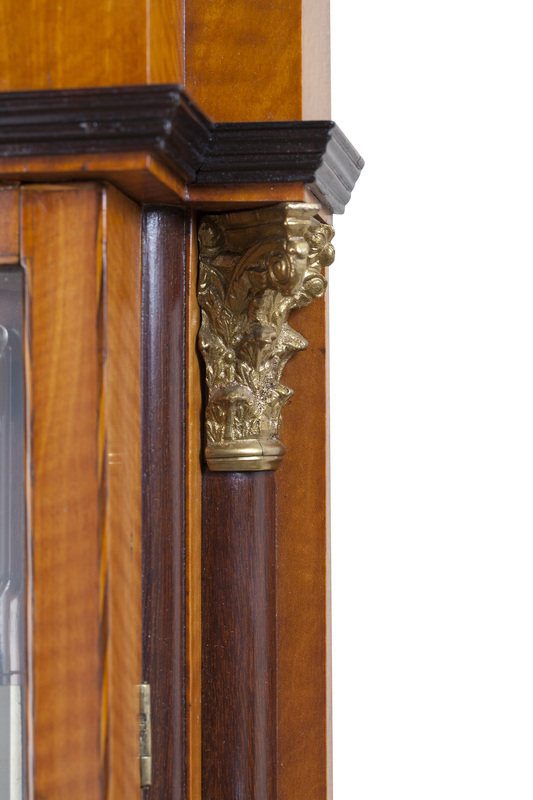 The oakwood case is veneered with satinwood and rosewood, decorated with inlayed borders of lemonwood. The glazed door is made of mohogany. The rosewood pillars with brass basements and capitals. – Bert Bolle, Barometers in beeld, page. 237, note 140, page 240, note 208 and 216. – Bert Bolle, Barometers, p. 238 en 239. – Th. H. van Cotthem, 200 Jaar antieke barometers 1670-1870, p. 47. Partnership of J. Solaro and Donato Butti from c. 1800 to 1840, Vijgendam 39 Amsterdam.